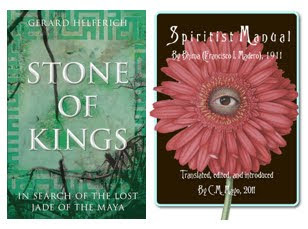 Gerard Helferich, author of Stone of Kings: In Search of the Lost Jade of the Maya, and C.M. Mayo (Yours Truly), translator of Francisco I. Madero's secret book of 1911, Spiritist Manual. Introduced by Eva Hunter, editor of Sol Literary Magazine. Recorded on February 22, 2012 in the café of Biblioteca Pública, San Miguel de Allende. *57 minutes. One podcast per month until the end of 2013. The most recent: Charles Angell in the Big Bend. Up next: Mary Bones on the Lost Art Colony. So, yeah, I am totally into podcasts! I'll be offering a workshop on podcasting for writers at the Writer's Center, near Washington DC, this summer (details to be announced), and meanwhile, after our chat in San Miguel de Allende last week, novelist Sandra Gulland spilled the beans over at her blog. Merci beaucoup, amiga! Writing Loglines and the Concept of the "Eyespan"
I resisted writing loglines for a long time, for I was of the school of Flannery O'Connor's famous saying (as I recall it), "if you want to know what the story is about, read the story." In other words, I believed in the mysterious resonance of literary profundity-- and, oh yeah, I still do-- but I have come to appreciate the focusing power, both for the writer herself and for her sales team (agent, editor, marketing staff, booksellers, etc, etc) of packing the whole enchilada into one super-yummy bite-- because, otherwise, you and your readers will be left vaguely wondering, um, what might it be? "A good meal?" Well, that could anything from a chunk of cheese to a 5 star foie gras extravanganza. Specificity entices. 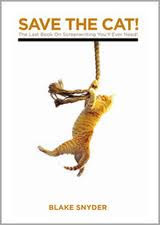 I just wrapped up a few days of giving writing workshops in San Miguel de Allende, and on the last day, I evangelized about loglines which I would have done anyway but it so happened that I had just, the night before, finished reading Blake Snyder's Save the Cat! a both amusing and practical guide to writing screenplays which, by the way, offers a slew of examples of great loglines. I don't write screenplays (yet) but the basic principles of storytelling are the same, whether for the screen or the stage, the page, or lo! ye olde campfire. Seriously, if you're writing any kind of story, read Save the Cat!, have a chuckle or nine, and save yourself a heap of headaches. Snyder writes, "If you can't tell me about it in one quick line, well, buddy, I'm on to something else." Well, Yours Truly defines the so-called logline as a one to two sentence description of the book that (a) tells the reader what to expect and (b) entices. From literary journalist Sara Mansfield Taber comes a deep and wondrous memoir of her exotic childhood as the daughter of a covert CIA operative. Not long ago the Big Thicket of East Texas was still one of those places singular in its southernness, like the Mississippi Delta or the Carolina Low Country; now its old-timers and their ways are nearly gone. They will not be forgotten, though, for in My Grandfather's Finger, Edward Swift recalls a Big Thicket populated by family and friends as gloriously vibrant and enigmatic as the land itself. If you google around, you will find a multitude of webpages with advice, and schoolmarmy formulas, for writing log lines. Such rigidity might be apt for certain industries (TV pilots?) but for books, we have a scootch more wiggle room. But not past the eyespan. P.S. I offer several detailed reading lists for writers here. When will I be teaching another workshop? Probably in the summer, details to be announced. Visit my workshop schedule or, for updates, sign up for my newsletter here. Now live: The Marfa Mondays podcast, this month, an interview with Big Bend expert Charles Angell, which took place at the Hoodoos in Big Bend State Park, right on the Rio Grande, and in Fort Leaton, near Presidio, Texas. Listen in at www.cmmayo.com/marfa or directly at podomatic.com. The Marfa Mondays Podcasting Project is a monthly podcast about Marfa, Texas and environs. It began last month (listen to the introduction here), and will run through the end of 2013. >More mini-clips about Marfa and the Big Bend. 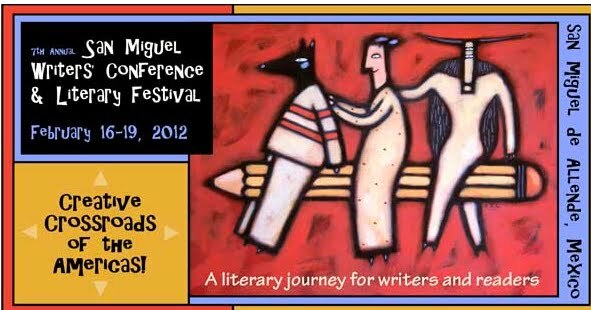 Writers conference in San Miguel de Allende this weekend with (yeah!) Margaret Atwood, Elena Poniatowska, and many more outstanding writers from Canada, the U.S., and Mexico. I'll be giving a one hour "Techniques of Fiction" workshop during the conference on Saturday, a brief reading from my novel The Last Prince of the Mexican Empire on Sunday, and, following the conference, a two day "Techniques of Fiction" intensive (4 hours each day). The whole enchilada of info + online registration is here. HOUSTON (February 13, 2012) - The Librotraficante Caravan will travel from Houston, Texas, to Tucson, Ariz., carrying a payload of contraband books, creating networks of Underground Libraries and leaving community resources in its wake. One of many responses to Arizona’s unconstitutional laws prohibiting Mexican-American Studies, the Librotraficante Caravan has captured the imagination and hearts of activists, writers, educators, and students from all walks of life who want to preserve freedom of speech. The Librotraficante Caravan launches in Houston at 10 a.m. on Monday, March 12, from Casa Ramirez Folk Art Gallery (241 West 19th Street, Houston, Texas 77008.) It will stop in San Antonio and El Paso, Texas; Mesilla and Albuquerque, N.M., and culminate in Tucson, Ariz., on Friday, March 16. On St. Patrick’s Day, Saturday, March 17, we’ll host a huge literary celebration of El Batallion San Patricio at 6 p.m., celebrating Irish and Mexican collaboration of the past. The caravan celebrates Quantum Demographics, or multifaceted cultural unity, throughout its tour also highlighting African-American and Native American literary contributions along the route. The entire schedule is available online at www.Librotraficante.com. With its radio program and blockbuster literary showcases, Nuestra Palabra: Latino Writers Having Their Say has 13 years of experience promoting Latino literature and literacy with authors and thinkers from across the country. This once informal alliance of artists, activists, educators, and professionals has galvanized to create cornerstone structures for a network that will remain in place for future causes as well. The full spectrum of this network links the talents of such people as Genius Mac Arthur Grant recipient Sandra Cisneros, whose beloved novel HOUSE ON MANGO STREET is prohibited in Tucson High School classrooms; Southwest Organizing Project, contributing extensive experience organizing national caravans and publisher of banned book 500 YEARS OF CHICANO HISTORY IN PICTURES; to Unidos, the student group in Tucson that is organizing teach-ins, while still attending classes and pursuing their education. Banned writers have embraced the caravan and those that will participate along the route include Sandra Cisneros, who kicked off our fundraising efforts by making a generous donation; Guggenheim Fellow Dagoberto Gilb, whose work recently appeared in the New Yorker and Harpers simultaneously; and best selling author Luis Alberto Urrea, with multiple titles found on the banned book list was the first to enthusiastically support the project through Twitter. Other literary giants participating in the Librotraficante Caravan include Rudolfo Anaya, whose seminal novel BLESS ME ULTIMA is banned; Denise Chavez, FACE OF AN ANGEL, who is hosting the caravan in Mesilla, N.M., and who organizes the Annual Border Book Festival; Lalo Alcaraz, creator of the syndicated comic LA CUCARACHA and who coined the phrase “Self Deport”; and Rene Alegria, founder of Boxing Badger Media and www.mamiverse.com, who attended one of the impacted high schools in Tucson. Institutions that have already confirmed to host the caravan include the Guadalupe Cultural Arts Center in San Antonio, Texas, and the National Hispanic Cultural Center in Albuquerque, N.M.
3. Celebrate diversity. Children of the American Dream must unite to preserve the civil rights of all Americans. 4. Create a network of resources for art, literature and activism. 1. Underground Libraries: Librotraficantes will donate copies of the banned books a local nonprofit in Houston, San Antonio, Albuquerque and Tucson. These sites will not only be given copies of the banned titles, but from now on, all multicultural authors are encouraged to mail copies of their books to these sites when they are published, so that our community will always have access to our literature. 2. Teach-ins and a Supplanted Book List: Workshops that include free curriculum guides with literary excerpts and lesson plans that can be used in class and immediately applied to other works. 3. Network of Librotraficantes across the country: This is a case of new media saving the classic media of books. Had Arizona done this ten years ago, we most likely would not have heard about it until it had impacted a second generation of youth. However, because of new technologies and the network of writers and activists who are communicating on multimedia platforms, we were not only able to hear about Arizona’s actions, but to also utilize new media tools to organize some classic activist strategies to respond - from now on! To become a part of history in the making, visit www.Librotraficante.com and click on Donate. For Literal Magazine Blog, Rose Mary Salum interviews Yrs Truly about my translation of Francisco I. Madero's secret book of 1911. 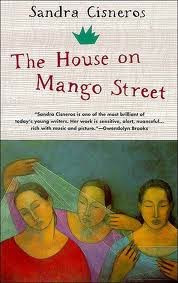 I'll be reading from and discussing this book in San Miguel de Allende for PEN / Sol Literary Magazine on February 22nd. More info about that event here. Speaking of San Miguel de Allende, I'll be at the writer's conference the weekend of February 18 and 19 (with Margaret Atwood, Joy Harjo, Elena Poniatowska, Araceli Ardón, Michael K. Schuessler, and many more) and then teaching a two day Techniques of Fiction workshop February 20 and 21. More info here. Oh, you thought you were eating honey? Think again (ewww). P.S. My translation of Agustin Cadena's short story "Murrillo Park," in this collection, and I blogged for Large-hearted boy myself back in 2009. It was a most interesting musical exercise. P.S. You can really surf around in there, quite interesting. I like the star-gazing platform. P.S. Read founder Eva Schweitzer's guest-blog post for Madam Mayo here. Burro Halls Posts Even More More Pug Pix! (It has yet to top this one, however). Steve Sando, founder of Rancho Gordo, may well be the most out-of-the-box bean farmer in the world. 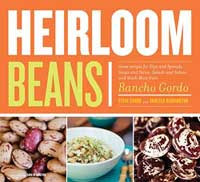 He's the author of Heirloom Beans, a beautiful book packed with information and recipes. I can highly recommend his blog and free newsletter, which you can signup on the blog or the main page. Click right here to shop on-line for Steve's hierloom beans and more. Over to you, Steve! I grew up eating pinto beans almost exclusively. My family enjoyed no Mexican heritage but the Mexican influence is hard to contain in California and my family’s “easy” food wasn’t mac and cheese but tacos. Ground beef, orange cheese, corn tortillas, Victoria salsa (with the meaningless picante thermometer) and of course Rosarita brand refried beans. My father would always claim to “doctor them up” but he never told us his secrets and I suspect it was something mundane like a pinch of onion powder or a few drops of olive oil. Whatever it was, it sold me at the time and I had a passion for beans. Later, I discovered black turtle beans and these seemed about the most exotic and delicious thing I’d ever encountered. How could such a simple thing be so wonderful? For years, these two beans seemed to fit the bill. I learned to cook them from scratch, which at first seemed insane. How could I take something so hard and make it soft and dreamy? It turns out all it took was a little practice. I had a career crisis as I rolled into my forties and the obvious answer to me was to take up gardening. It made little sense but I had the feeling that as long as I tended a small home garden, it didn’t matter so much which direction my career took. I could have made worse decisions. I would study the seed catalogues and plan the new year’s garden accordingly. By chance, I planted a bean called Rio Zape. I cooked many of them as a green bean and was happy but it’s when I let them dry and cooked them like a dried bean that my world changed. They reminded me of my beloved pintos but with much more depth and interest. I could detect a distinct chocolate flavor and wait, was that coffee, too? How is it that this bean was unknown and yet it was so easily superior to pintos? Ten years later and the rest is history. I’ve made a career out of eating rare and wonderful beans and I think bland, commodity beans have their place in feeding a hungry world a cheap protein, but what a shame that we’ve barely scratched the surface with heirloom beans. There are dozens of great heritage varieties worth discovering but here are five, somewhat accessible, that you should know about. As I mentioned above, this pinto-like bean has hints of coffee and chocolate and is very easy to prepare. I love them with just an diced onion, a smashed garlic clove, water and the beans. The result is heady. Runner beans are in a different family than most common beans. They generally produce large, starchy beans that can be waxy or even buttery. Sophie Coe mentions them as one of the first cultivated crops in Meso-America in her seminal book, America’s First Cuisines. You see them in all sorts of colors at the markets and tianguis in Mexico and yet it’s super rare to see them on any kind of menu, even in Mexico. I like the purple ones (Morado) but the golden colored ayocotes from Puebla are also especially delicious. You may hear from an old Mexican grandmother that they are harder to digest than other beans but you should just smile and try them when she’s not around. Presumably from the state of Jalisco, this bean was fancied by Thomas Keller of the French Laundry in Napa Valley and Per Se in New York. It had never been a very popular bean but because Chef Keller loves it, we grow it and now this bean that was on the brink of obscurity is being grown commercially and is well-loved by chefs. It’s very rich and I think it needs some bitter greens to offset its dense texture. If you remember limas primarily as a member of the frozen food staple, “vegetable medley”, you probably hate them. If you have an open mind, you will love these lima beans, also known as Chestnut Limas. They have a chestnut texture and meaty bean broth. Try them tossed with sautéed wild mushrooms and just a little too much garlic and you will swoon. If you live in central Mexico, you probably have had Mayocobas, also known as Peruanos and sometimes Canario beans. They’re versatile, quick cooking and thin-skinned so they can be used in dozens of different ways, from soups to salads. Most Mexicans will cook them with a little onion and lard but if you cook them in a more European style, with finely diced mirepoix (celery, carrot and onion) and garlic with a little olive oil, they almost taste like you’ve cooked them in chicken stock. They also make a fine refried bean. ---> For the archive of Madam Mayo guest-blog posts, click here. The most recent is Andrew Dayton on 5 Book to Get Your Head Inside Iran.